Built with the principles of New Urbanism, this Louisville suburb is reviving an old way of city building. 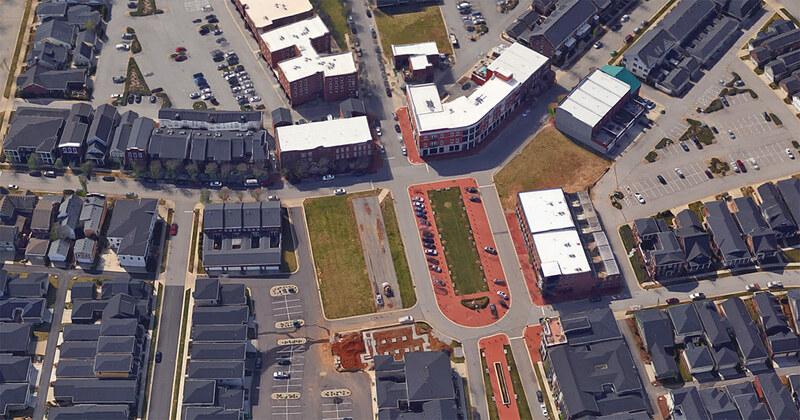 So-called New Urbanism is a modern day planning term that refers to old-style methods of community design. In other words, New Urbanism integrates a mix of residential and commercial functions into the same development, just like core city neighborhoods when they were built a century or more ago. Think the corner stores in Old Louisville, the varied streetscapes of the Cherokee Triangle, or the commercial streets of the Highlands. New Urbanism is city building the way we used to do it. Master plan for Norton Commons. While New Urbanism is first and foremost about a pattern of building in a compact, walkable way, the term often brings to mind traditional building aesthetics that populate older city neighborhoods. While there’s nothing that says a New Urbanist development couldn’t be packed with cutting-edge modern architecture, most developments use the old styles as way to connote the traditions of decades past. In fact, a lot of Norton Commons is meant to evoke a sense of history even though the neighborhood is still quite new. Besides historic architectural styles, even street names set the tone. Meeting Street, the main drag through Norton Commons, is clearly a nod toward the main street of historic Charleston, South Carolina. Norton Commons is Louisville’s preeminent New Urbanist development. It was designed by architecture and planning firm Duany Plater-Zyberk & Company (DPZ), headed up by the husband-and-wife team of Andres Duany and Elizabeth Plater-Zyberk. DPZ is the foremost practitioner of this form of planning. The firm also created the nation’s most recognized New Urbanism town: Seaside, Florida, which you might recognize as the set of the movie Truman Show. Duany and Plater-Zyberk have crafted dozens of similar communities around the country since then. A walk (or drive) through Norton Commons is like being transported back in time to the late 1800s when life was simpler and houses actually had front porches for people to sit out and foster a sense of community. While plenty of Louisville’s great older neighborhoods have already mastered these principles of urbanism, the way we build today has largely forgotten them. While this style of building was taken for granted a century ago, it has required a lot of effort and scrutiny to bring back today. Designers have created “pattern books” that describe how buildings should relate to the street—i.e. how far from the sidewalk a porch can be to allow people to talk comfortably—and how scale should relate to one another. It seems simple, but New Urbanism represents a fight by dozens of architects and planners over the past several decades. And in Norton Commons, this new way of city building is on full display. All the amenities of a real neighborhood—restaurants, shops, offices, playgrounds, and more—are within walking distance, creating a comfortable lifestyle for all within its cozy confines. 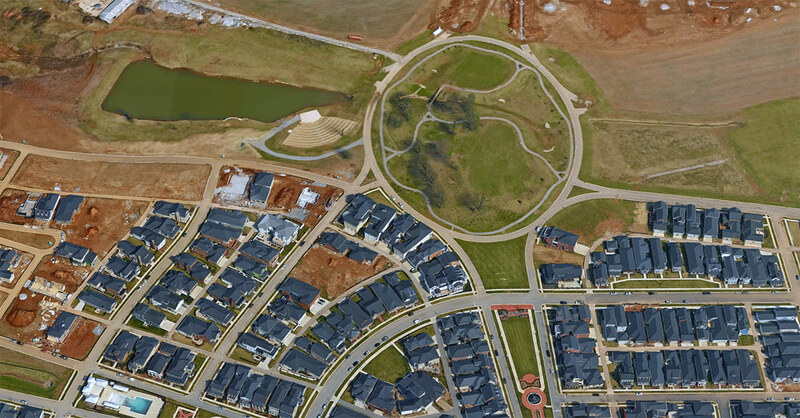 New Urbanism—and Norton Commons—has its detractors who label the concept as “green sprawl” since this is still new construction in suburbia. Norton Commons, after all, was built on a former horse farm. Others have derided it as “drive-to urbanism” that does little to cut dependency on the automobile. It can be an excruciating task to drive out to Norton Commons on overcrowded arterial highways just to have a pleasant place to walk and shop. Still others deride the false sense of history such a place evokes. The neighborhood hasn’t had the luxury of a century of patina as do the Highlands and Old Louisville, and we’re not used to seeing this type of shiny new architecture. And while there’s some truth to those criticisms, there are valuable lessons taking shape in Norton Commons that we’d do well to learn from in building the rest of the city, whether on the suburban periphery or right in the middle of Downtown. While it is expensive, Norton Commons isn’t some whitewashed version of a perfect Mayberry community. It’s a real-life functioning “village” in which residents could, quite feasibly, have nearly all their daily needs met. More importantly, Norton Commons is teaching many Louisvillians to be urban again. While many a suburbanite might not commit to living in Old Louisville, Norton Commons brings the urban form out to the suburbs—and it teaches a new generation to appreciate walkable living. Living in a walkable neighborhood today, for the most part, requires you to live in a historic property. And while we all love Louisville’s historic architecture, many people do not want to commit to the maintenance and upkeep that a historic house entails. It also shows builders how to build new structures in the old tradition. And it shows there’s a strong demand for this kind of construction—there’s a reason Homearama is making a repeat appearance in the neighborhood. We’d hope that builders across Louisville could look to Norton Commons for inspiration in building in an urban way elsewhere in the city. It’s cool for what it is but too bad you’ll still spend 1.5 hours or more a day in your car driving to where most of the jobs that pay a salary that would be able to afford a house there are. Doesn’t leave a lot of time for actually enjoying the ‘hood. We moved from an historic neighborhood in Northern Kentucky to Norton Commons. We’re retired and didn’t want to continue the maintenance and upkeep of our 100+ year old home. In Norton Commons, we have the advantage of urban style living with an almost maintenance-free house. I can get my hair done, go to the dentist, walk to the Y,have a choice of several restaurants, and go shopping in the many interesting shops along the way. This is all done without taking my car out of the garage. Norton Commons in the antithesis of urban. Give me a break. How much did you pay for you home out in la-la land? Where are the trees? The privacy? The homes are stacked on top of one another!! What about all those phoney “boutique” shops and restaurants that only the yuppy upper middle class can afford to spend money? How is living right on the synder and 71? Does that keep you up at night? 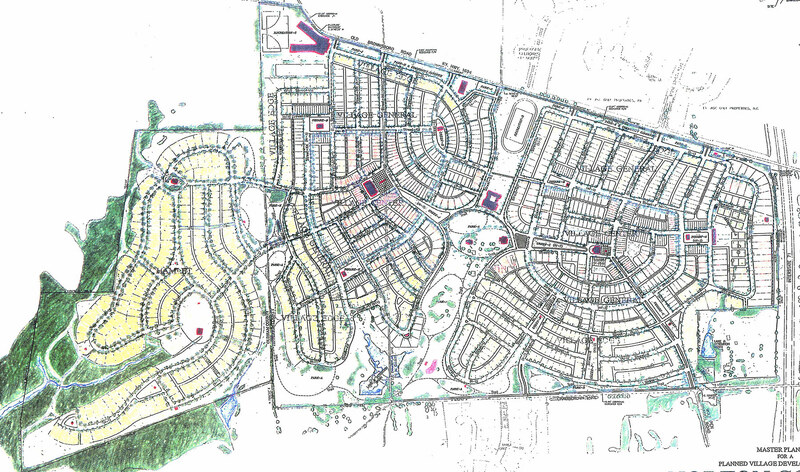 Its another country club subdivision is the dregs of the east end. Traffic, concrete, sprawl, big box stores, stripmalls. That’s what you enjoy? The way they expanded chamberlain lane and 22 is sickening. You can have it. Fortunately for me, I live in Norton Commons and work three miles away at the Ford plant on Chamberlain lane. If I had to work downtown I would definitely live downtown. I’m feel strongly about living close to where you work. Just realized that the tan house in picture #8 is my house! Branden – You are correct. There are some obvious lessons to be learned here. Even though it is in the suburbs, it is not anti-urban in any way. While it is pricey, it offers some of the good things about urban living without the bad stuff like grit, noise, and crime. Aside from the obvious problems of being so far away, and leading to the expansion of roads and destruction of the environment (there was recently about an article where people in the area were complaining about a new development adding to congestion, as if they hadn’t already in transforming a rural area into a pretty suburb), I think it is a great example of new urbanism. I’ve seen other new urbanist developments that seem to get a lot of things wrong, and I think Norton Commons does blow other new urbanist inspired developments around the country and in Louisville out of the water and gets it mostly right, like Park DuValle and the development that replaced Clarksdale, which still seems too suburban with their reluctance to build up to the sidewalk and corners. Hopefully it does inspire new developments like when Beecher Terrace gets replaced. Yeah right. Norton Commoners walk except when driving to & from work, Costco, the Paddock shops, Kroger, Springhurst… All of their walking must be the reason why KyDOT is proposing to expand interchange lanes at 265 & 71. The fact the “Norton Commoners” drive to work, Kroger, and Costco is a dishonest argument. Most people that live in “cool” in-town neighborhoods like Crescent Hill, Germantown, the Highlands, and Portland also usually drive to work, Kroger, and Costco. I-71 needs to be expanded because many commuters choose to live in Oldham County. Thank you for pointing that out Jeff. Nothing’s perfect — yet. Just moving in the right direction perhaps. I’d be willing to bet that suburbanites in NC impress more carbon imprint by driving longer distances & short distances more often urbanites closer to downtown and instrumental in-town vendors. The ramp expansion @ 71 @ 265 is for NE county traffic flowing southward. Google it. Walk again?! The majority of the residents either own or want a golf cart to get around.